Dawn McKechnie, also known as "Kaijugal" has been involved in the Canadian costuming community and costuming fandom for over 20+ years. 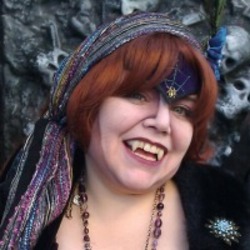 Although she has won numerous awards throughout the years for her unique costume creations, in the past ten years Dawn has been more involved with organizing, administration, and education at costume events. She currently not only coordinates the Cosplay Events Department for Anime North, but is also the director of several masquerades including Hobbystar's FanExpo and Otakuthon in Montreal Canada. She has also judged at many cons such as, Worldcon, Fan Expo, Anime Next, Polaris, Otakuthon, and Costume Con.